Lock-in Amplifier is used for detecting and measuring AC signal’s amplitude or phase buried in noise as high sensitive AC Voltmeter with noise immunity. NF has full confidence in its experience and know-how in lock-in amplifiers and thus the NF’s Lock-in Amplifiers are used by many customers like in the fields of physics and science including spectroscopic analysis. 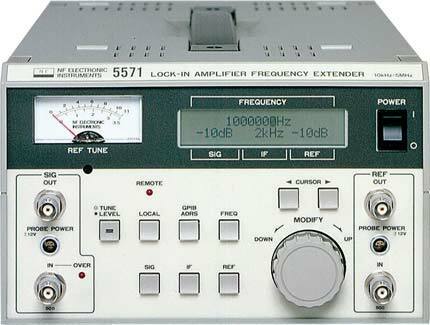 When higher frequency is in concern, a lock-in amplifier frequency extender is required in order to extend the upper frequency limit to a certain level. The NF 5571 Lock-in Amplifier Frequency Extender will do this.